SHANGHAI -- China's president called Tuesday for the creation of a new Asian structure for security cooperation based on a regional group that includes Russia and Iran and excludes the United States. Xi made no mention of Beijing's conflict with Vietnam over the deployment of a Chinese oil rig in a disputed portion of the South China Sea. CICA, whose 24 member nations also include Korea, Thailand and Turkey, should become a "security dialogue and cooperation platform" and should "establish a defense consultation mechanism," Xi said. He said it should create a "security response center" for major emergencies. The proposal marks the latest effort by Beijing to build up groups of Asian or developing governments to offset the influence of the United States and other Western governments in global affairs. Alliances are not based on a piece of paper. They're the result of real trust and interaction. In 2001, it founded the Shanghai Cooperation Organization with Russia and four Central Asia nations to counterbalance rising American influence in the region and to combat Islamic and separatist political movements. Beijing also is a force in the BRICS group of major developing countries with Russia, India, Brazil and South Africa. Beijing sees common cause with other CICA members such as Russia and Sri Lanka in promoting a political model that pairs autocratic government with a market-oriented economy in defiance of the Western liberal democratic model. CICA was formed in 1992 at the initiative of Kazakhstan but has been little more than a discussion forum. Other members include U.S. allies such as Israel, Mongolia and Uzbekistan. Japan, seen by Beijing as a strategic rival, is an observer. The group is unlikely to produce a real security alliance, said Ross Babbage, chairman of Australia's Kokoda Foundation, a security think tank. "Alliances are not based on a piece of paper. They're the result of real trust and interaction," he said. "There may be some agreements ahead, but in reality, I don't see an alliance emerging." However, Babbage said Putin's presence at the meeting was significant for China-Russia relations at a time when both are diplomatically isolated -- Russia over Ukraine and China over its territorial disputes and U.S. accusations of cyber spying. 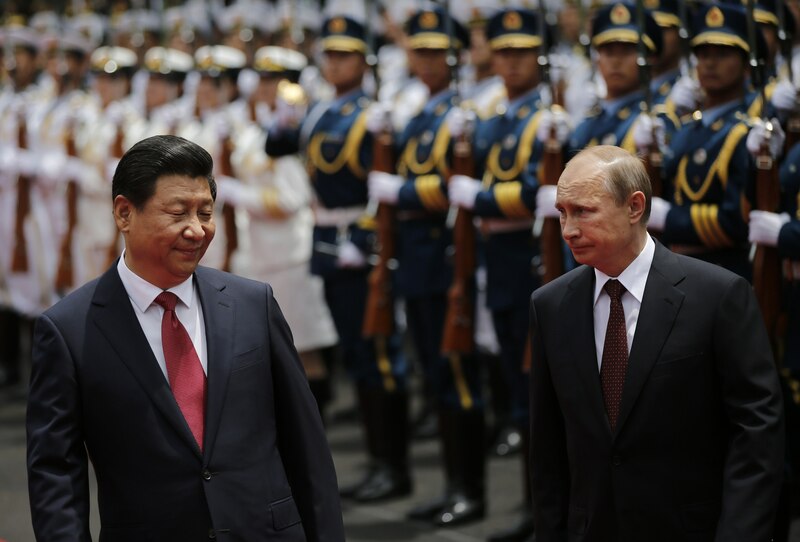 Both Putin and Xi are grappling with economic and political challenges and being assertive abroad can help to build nationalist support at home, Babbage said. "There's an interesting synergy from shared circumstances, with large parts of the world lining up against them and expressing strong concerns over their behavior," he said. China is embroiled in conflicts with Japan over the East China Sea and with Vietnam and other Southeast Asian countries over conflicting claims to portions of the South China Sea. Washington has complained China is being provocative. Beijing says the Obama administration's effort to shift foreign policy emphasis toward Asia and expand its military presence in the region is emboldening Japan and other neighbors and fueling tension. Xi said Asian nations need to respond collectively to mounting problems including terrorism, transnational crime, cyber security, energy security and natural disasters. "We should have zero tolerance for terrorism, separatism and extremism and should strengthen international cooperation and step up the fight against the 'three forces'," he said.